TECNOFOAM is a range of polyurethane foams specially designed for projection and injection in residential, commercial and industrial construction projects. The range of densities available is designed to cover all of your specific requirements. TECNOFOAM G-2025 polyurethane system for thermal insulation is specifically formulated to apply foam with applied density around (±23~26 kg/m³). Its application has to be done by the specific spray equipment. The blowing agent is water. TECNOFOAM G-2035 polyurethane system for thermal insulation is specifically formulated to apply foam with applied density around (±30~35 kg/m³). Its application has to be done by the specific reactor equipment. The blowing agent is water. TECNOFOAM G-2040 polyurethane system for thermal insulation is specifically formulated to apply foam with applied density around (±40~50 kg/m³). Its application has to be done by the specific spray equipment. The blowing agent is water. Spray polyurethane foam (SPF) system for thermal insulation(applied density ±40 kg/m³). Fire reaction M1. TECNOFOAM G-2100 polyurethane system for thermal insulation is specifically formulated to apply foam with applied density around (±100~130 kg/m³). Its application has to be done by the specific spray equipment. The blowing agent is water. TECNOFOAM G-2035 HFO spray polyurethane foam system for thermal insulation is specifically formulated to apply foam with applied density around (±34~38 kg/m³). Its application has to be done by the specific reactor equipment. The blowing agent is HFCO gas. TECNOFOAM G-2040 HFO spray polyurethane foam system for thermal insulation is specifically formulated to apply foam with applied density around (±40~46 kg/m³). Its application has to be done by the specific reactor equipment. The blowing agent is HFCO gas. TECNOFOAM G-2060 HFO spray polyurethane foam system for thermal insulation is specifically formulated to apply foam with applied density around (±52~62 kg/m³). Its application has to be done by the specific spray equipment. The blowing agent is HFCO gas. 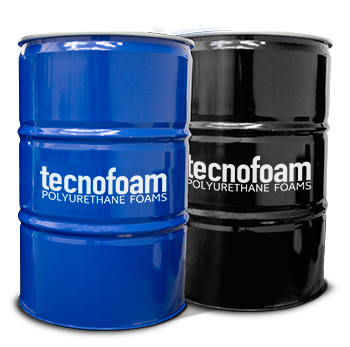 TECNOFOAM I-2035 HFO is a system composed of two components (polyol and isocyanate) produces polyurethane foam of an applied density from 35 to 45 kg/m ³, is suitable for injection isolation application as on ducts, tubing, colds stores, and rooms. The blowing agent is HFCO gas.